Any of our standard team building activities can easily be turned into all-inclusive team retreats. Let us be your event planner. Our experts will reduce your worries instantly. We take care of your hotel bookings, meeting room setup, agenda creation, and the food and beverage. We also organize a great group team building activity for you. You just sit back and take all of the credit! Want a three day company retreat with hotel, meals, breaks, and a team building event? Do you want a team building retreat with two full days of bonding and camaraderie? Want just a half-day get away, but you don’t want to have to pick a location or organize the venue? No problem! We can organize the entire event for you. Our event planners make it easy for you. Click any of the Team Retreats below for a full description. Build-A-Bike Workshop® Retreat: The Build-A-Bike ® workshop becomes the centerpiece of this meeting. You can either let us organize training modules around Build-A-Bike®, or we can help you organize your regular business meetings, speakers, and breakout sessions. We help you complete your agenda. 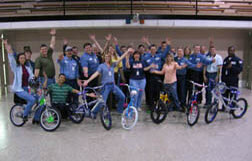 Build-A-Bike® Team Retreats are very popular! Camaraderie Quest Retreat: Your team will really have to put their heads together to solve challenges in an outdoor scavenger hunt. Participants strengthen communication and problem-solving skills while having a blast. This outdoor event is also combined with indoor breakout sessions. As a result, it balances skill development and outdoor fun. ½-Day, 1-Day, and 2-Day programs are available. Rescue Bear ®: This program is fun and a low-cost way to conduct a comprehensive annual meeting for your group. It also offers a charity donation. Participants strengthen skills that lead to good teamwork including communication and leadership skills. It also covers meeting and problem solving skills as well. The group problem-solving skills alone average over a $100,000 per team return on investment! 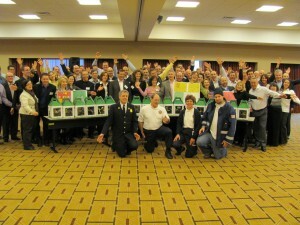 In addition, the Rescue Bear ® activity is a fun way to give back to the community in the process.